COULSON, AGENT OF SHIELD NO MORE! Agents of SHIELD: “The Third Faction” makes one thing clear. 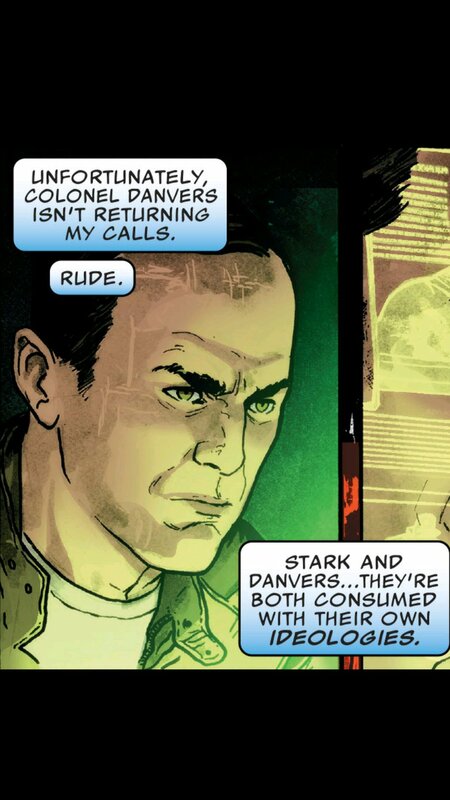 There have been two different incarnations of Coulson’s team in comics. From the original run in 2014 under Mark Waid’s direction to the newer run under Marc Guggenheim, the show’s characters have seen different versions, much like their older comic book counterparts. It’s also important to note that the MCU incarnations and the Comic Book are COMPLETELY AND TOTALLY DIFFERENT. This is made more obvious in Marc Guggenheim’s run with the characters, and to be honest it pays off. We get to see the return of several noted characters (IE, Deathlok, Grant Ward) we get to see the origin story for several things from the show (an origin at least) like Lola. The lives of the characters are completely and totally different and their reactions are totally different. STORY: In this case it pays off with Coulson deciding like many characters (most notably Wanda Maximoff) that the conflict between Carol and Tony is difficult and not one he wants to play a part in. He’s determined to do what Phil Coulson does, try and get the sides to talk to each other. Instead of being blinded by his love for superheroes he wants to try and get both sides to work together. 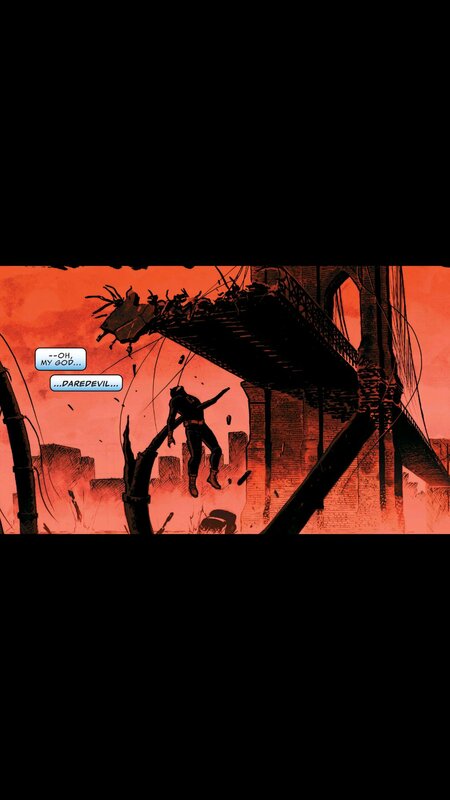 He’s motivated by literal love of the game as he discovers the next prediction that Ulysses the inhuman is about to make, namely involving the death of Daredevil at the hands of a major disaster in New York City. Yikes. Melinda is sent out by SHIELD to capture Coulson who tries to explain that he’s doing it for the love of the game. 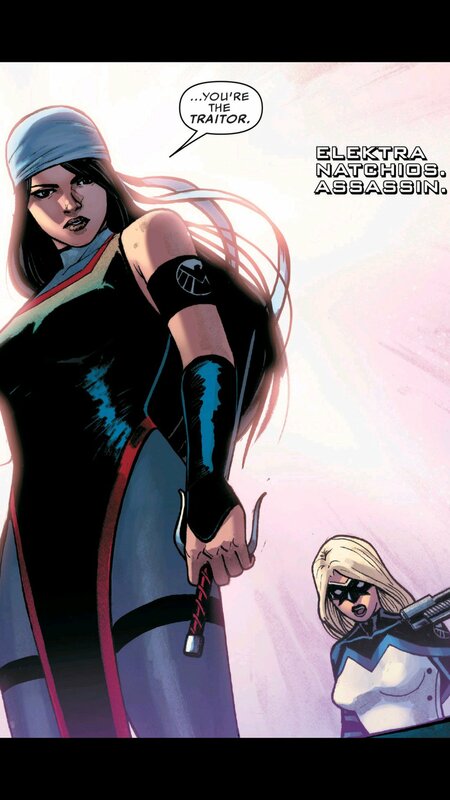 She’s having none of it (good job Melinda) but the two of them are interrupted by Carol Danvers, who in an earlier issue 5 responded to Phil Coulson’s call to help him capture Grant Ward. The two are friends, everybody’s friends with Phil, and it shows how divisive differing ideologies can be when she lifts him up into the air and threatens him. In the beginning of this run, Jemma was infected by a bioweapon at an abandoned AIM facility. She’s dying (what a twist!) 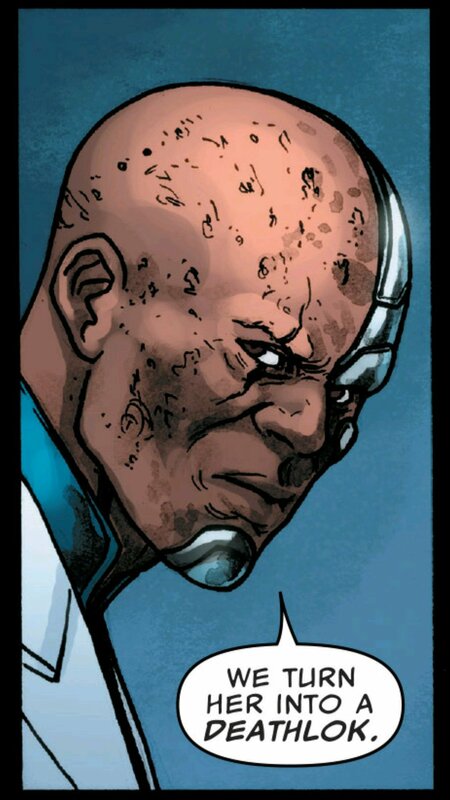 and deathlok’s solution is to do what was done to him. Make her into a deathlok. Elektra! What’s Elektra’s goal? To get people to focus away from the superpowers, the arguments and the fights – and to clean house. Her first objective? The Traitor on Coulson’s Team. 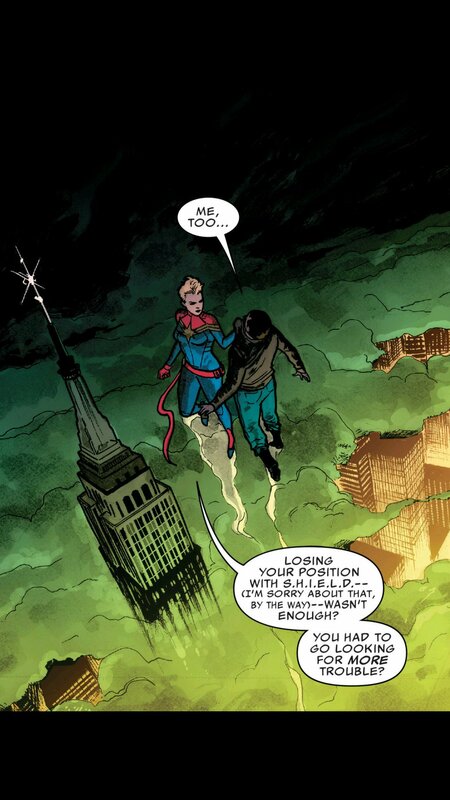 ART: To be honest, when you compare Waid’s run and Guggenheim’s run the art for Waid’s run has a more fluid feel. I like the style of the characters and it’s got a little bit more of an artsy feel. This clean cut style is very comic-book to me, which makes sense because it’s a comic book. The coolest thing about this comic’s art personally is the cover. 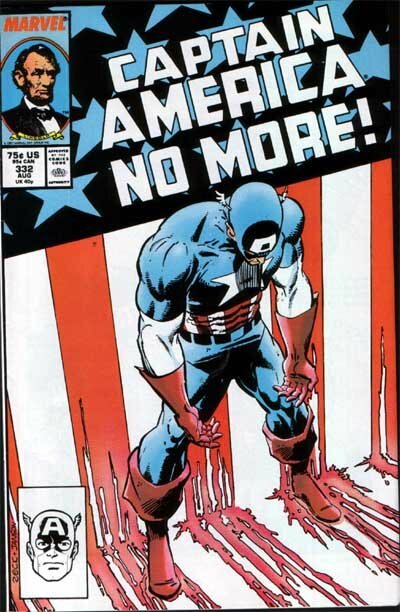 It’s a variant of a Captain America cover which shows the connection between Steve and Phil. Out of all the characters the connection between Steve Rogers and Phil Coulson is the most pure to me. Phil is Steve in his own way, just like Steve was Phil before the super soldier serum. 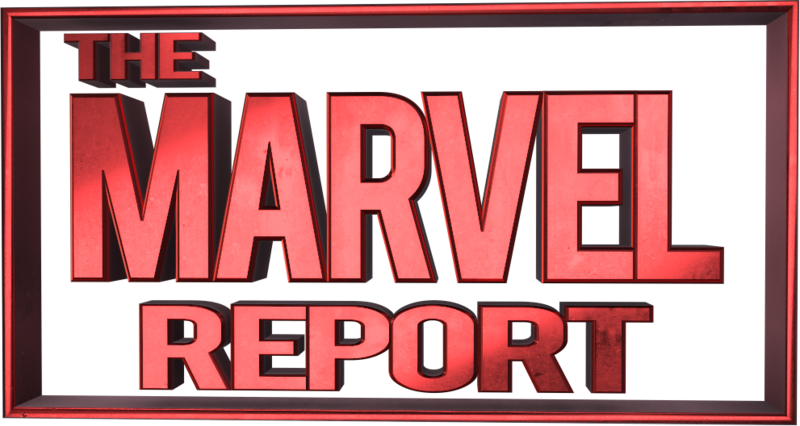 For a character that began in films and was brought to life by Clark Gregg, he’s created something iconic. 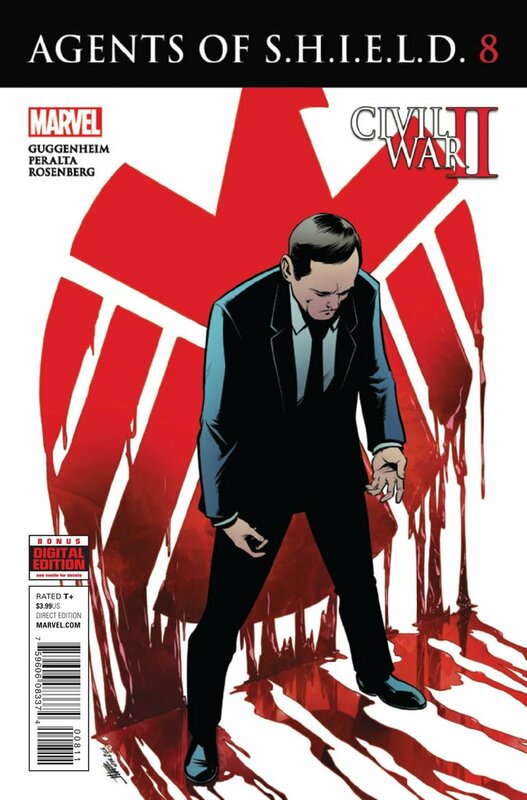 Phil Coulson earns this cover, and this comparison. VERDICT: I was just having a conversation with somebody on twitter regarding the fate of Ulysses, the character inspiring these arguments. While I’m not caught up on the main issues quite yet, the overall impression seemed to be one of imprisonment. The guy, after being put through a procedure no one in their right mind would want, is now sitting in a room being told he has to save the planet and use his gift. This doesn’t entirely sit well with me, and so Coulson who’s ardently “Superheroes can do no wrong” in the television show speaking rationally was not only a return to form, he was echoing my sentiments. 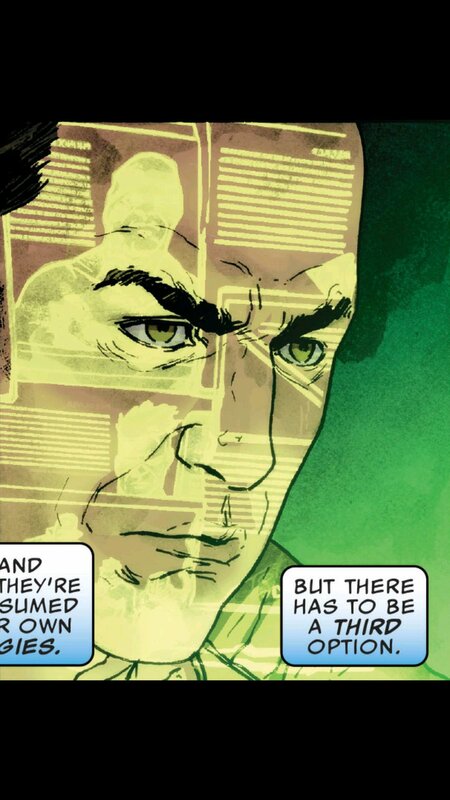 More then any character Phil is the Marvel comic’s reader avatar in the universe. The fact that he attempts to forge some sort of compromise between Carol and Tony, that he wants to see a third option is inspiring because there should always be a third option when it comes to such extreme ideologies. Do we not use the weapon, do we use the weapon is such black and white thinking it’s painful. With superheroes, their world is black and white. Good versus Evil is at the core of their world, it is only as our world has evolved that theirs has changed shape and form. Suddenly good and evil aren’t as cut and dried, suddenly good guys have to do bad things, suddenly as Ms. Marvel puts it, “Good isn’t something you are, it’s something you do.” that’s a powerful statement and one that I feel Phil is embodying. Seeing him speak rationally in the face of both gods and monsters is empowering. I have no doubt he’ll pick a side at some point, or perhaps be driven to by the actions of issue 9, but Phil more then ever represents standing up for what you believe in in the face of adversity against people who have ultimate power. Phil loves superheroes. He loves Daisy, he loves his team, he loves the hulk and the avengers, Phil is all of us and they’re all tearing the world that he loves apart. Ironically Phil’s conflict is the conflict facing many Americans today which makes this run and this issue in particular far more chilling. When you are facing two terrible choices, which choice do you chose and why?